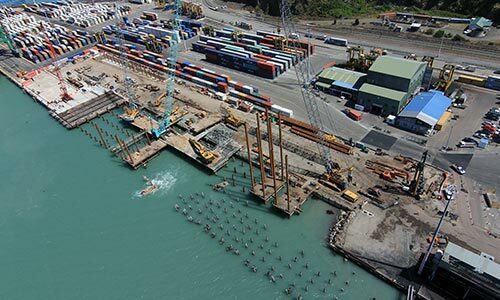 FSG was engaged to assist Opus and the Port of Lyttelton in resolving technical issues associated with the remediation of Cashin Quay which serves as the port of Christchurch, New Zealand. The first stage of works at Berth 2 (CQ2) required about 250 driven steel tubes as foundation piles for the new wharf. The Port is located on the edge of what was once a volcanic crater, and the challenging ground conditions consist of a significant depth of fill material, overlying soft marine sediments, volcanic sediments, and residual rock, which overly a steeply sloping volcanic bed-rock. Recognising the complexity of the ground conditions and the need for well-considered design, thorough constructability planning, and sound verification processes, Opus sought end-to-end project involvement from FSG. FSG services in the preconstruction phase included back-analysis of previous dynamic and static load testing of existing piles, and design and driveability analysis of new tubular steel piles. Expected founding levels were at depths of around 50m to 70m. 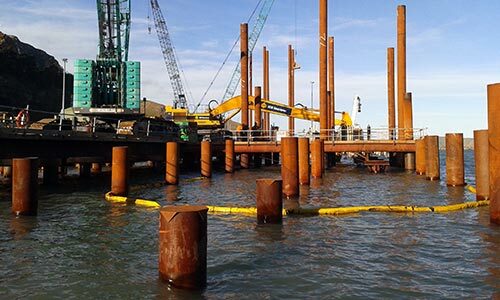 FSG provided constructability advice in relation to hammer selection, installation and verification procedures for the very long slender piles, input to piling specifications, risk management and pile procurement advice, and review of tender proposals and construction methodologies. The project delivery phase commenced in early 2014 and FSG has been engaged to provide PDA and PDM testing services, and engineering signoff for all piles. A streamlined and efficient verification process has been developed and implemented by FSG to ensure pile signoff in a timely manner, which is critical to the progress of the works. From a detailed analysis of CAPWAP results and driving information, FSG was able to identify some site specific issues that could lead to potential pile relaxation. By identifying the mechanism behind this observed behaviour, FSG was able to provide straightforward driving criteria for use by the contractor, which enabled a smooth sign off process and reduced the risk of hammer damage. The start to end involvement of FSG and close collaboration with both the client’s engineer and the piling contractor, ensured that the project risks were managed, and a practical pile review and sign off process was put in place, in challenging geotechnical conditions.